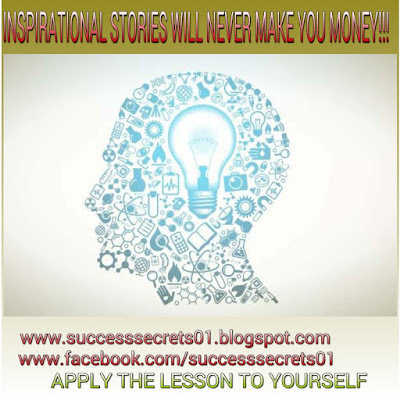 SUCCESS SECRETS: Inspirational Stories will not make You Rich or Give You Money!! 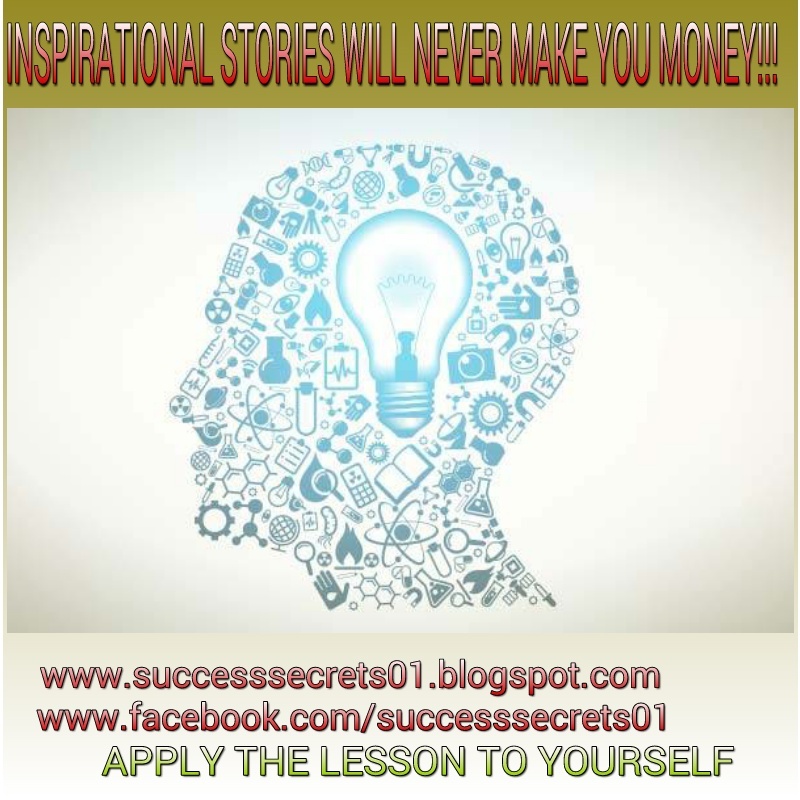 Inspirational stories will not make you rich or give you money! This might sound like a strange title for my blog post but it is true. In few hours, I will give a lucid presentation of why this is so and the only way inspirational stories can help you. For the moment, checkout this picture and drop your comments regarding the topic. Do you support it or not? What are you reasons for or against the topic? THE TRUTH ABOUT INSPIRATIONAL STORIES AND HOW TO MAKE THE MOST FROM THEM. inspirational stories are very important in our daily lives. They tell us grass to grace or rag to riches stories that inspire us. There are also inspirational stories of faith courage, love, etc. However, the emphasis of this piece is on pecuniary inspirational stories. You see, every normal person desires increased wealth and well being. That inherent desire is normal and praiseworthy. When we read inspirational stories that tell us of how people have moved from penury and obscurity to fame and fortune, two things happen. 2. Our innate desire for increased life - the desire to to do more, to be more and to have more causes us to crave the fame, success and financial gains acquired and enjoyed by the person in the story. We picture ourselves in this elevated state- oh! Only if I could wave a magic wand and get all that I want. We imagine the splendour of our mansions and the regality of our demeanour. We get charged up for as long as we can envision this mental mirage, but lo, reality quickly move in, we awaken to reality and the charge is lost! The duration of the charge varies from person to person. Few are moved by this charge long enough that they take on a lofty project, but once they meet with challenges on the way, they say to themselves: "maybe the good life is not meant for me. Have I not tried all I can do to get the good life and yet have I not failed again?" We need to listen carefully or read in between the lines. Inspirational stories each have a lesson to teach us. But to fully comprehend the lesson, we must listen or read with rapt attention. Do not read them like mere fiction novels. Then and only then can we pick up the lesson(s) which we can apply to our lives. This reminds me of Jack Canfield's introduction to chicken soup for the soul. He warned the reader to "forget every technique on speed reading" they might have been taught and slowly "soak up" each story's lesson(s). Here are his exact words:" When you are reading these stories, please forget everything you ever learned in your speed-reading classes. Slow down. Listen to the words in your heart as well as in your mind. Savor each story. Let it touch you. Ask yourself, what does it awaken in me? What does it suggest for my life? What feeling or action does it call forth from my inner being? Let yourself have a personal relationship with each story. Some stories will speak louder to you than others. Some will have deeper meaning. Some will make you cry. Some will make you laugh." The lesson is the key or take away. Sometimes, we might need to sit down for a while and then replay the story in our mind's eye frame by frame. Thereafter, we ask ourselves the most important question: what lesson(s) have I learnt from this story that I can apply to my own life?" For example, if you have listened to Jim Rohn's audio programs, chances are that you have heard the story of the young housewives who was inspired by her husband's refusal to give her ten dollars she requested for. That prompted her to decide that she will ensure she never have to ask again. She then looked for ways to get a skill, with her skill she searched for opportunity and found it and gradually she rose to become the vice president of a large jewelry company. The lesson is that she made her inspirational dissatisfaction work for her. Her determination to reject a repeat of such a situation where she is left at the mercy of her husband was her inspiration to action. What situation in your life are you determined to end today and what must you do to accomplish that? One major temptation is for people to listen to inspirational tapes just like music. You do not get the essence of the message that way. You do not get the essence of the message that way. To properly get the message, you need to reduce distractions to the barest minimum and treat the listening experience as a serious business. Granted, it is cool to multitask and the availability of inspirational audio books and tapes permits us to listen while driving, exercising or performing household chores. Even at such times, we should try the best we can to listen beyond music level of attention. Any unnecessary discussions at such times should be avoided. We should also create some time when we can listen Alone without distractions. We might need to repeat some segments we missed due to less attention and we might need to pause when we are so enthralled in another activity that we are getting so little or nothing out of the tape. I spent so much time in explaining that you must pay close attention to the story. This is not an endin itself but a means to an end. The essence of paying close attention is to enable you GET THE LESSON IN THE STORY. Every inspirational story has a lesson to has lesson(s) to teach us. If you are to benefit from an inspirational story, it behoves you to pin point the lesson learnt in the story. You can do this by asking yourself this simple question: WHAT LESSON IS THERE IN THE STORY FOR ME? or WHAT IS UNIQUE ABOUT THE WAY THIS PERSON ACTED UNDER THE CIRCUMSTANCES? "MY DREAMS ARE WORTHLESS, MY PLANS ARE DUST, MY GOALS ARE IMPOSSIBLE. ALL ARE OF NO VALUE UNLESS THEY ARE FOLLOWED BY ACTION. NEVER HAS THERE BEEN A MAP HOWEVER CAREFULLY EXECUTED TO DETAIL AND SCALE WHICH CARRIED ITS OWNER OVER EVEN ONE INCH OF GROUND. NEVER HAS THERE BEEN A PARCHMENT OF LAW, HOWEVER FAIR, WHICH PREVENTED ONE CRIME. NEVER HAS THERE BEEN A SCROLL, EVEN SUCH AS THE ONE I HOLD, WHICH EARNED SO MUCH AS A PENNY OR PRODUCED A SINGLE WORD OF ACCLAMATION. ACTION, ALONE, IS THE TINDER WHICH IGNITES THE MAP, THE PARCHMENT,THIS SCROLL, MY DREAMS, MY PLANS, MY GOALS, INTO A LIVING FORCE. ACTION IS THE FOOD AND DRINK WHICH WILL NOURISH MY SUCCESS." Whatever lesson has been learnt in step 2, we must apply them to our life. This might be in our relationship with others, it might be in our business, our health or any other area of our life. Only by application of its lessons can you gain from the inspirational stories. Only by acting out the lessons of the inspirational story in your own life's circumstances can you get money, happiness, health, or whatever good you desire. The next time you are out to make a sales call and you encounter many rejections and you remember the story of Thomas Edison or Henry Ford, what should you do? Under action or application, another very important point also comes to mind. You must be engaged in a business venture to which you be applying what you have learnt. Since we started out by by talking about money, assuming your inspirational story is about how someone made money, the person in the story was definitely engaged in one activity or the other. You cannot make without engaging in any activity expect to make money! You must be engaged in an activity capable of producing financial rewards. It does not matter whether it is your present employment or a new idea that came to you. The important thing is to realize that idleness cannot produce riches. I end this section with the words of Pablo Picasso- "Action is the foundational key of all success"
Repetition is said to be the mother of learning. This is still so true today as when the words were first spoken and written.After all, the father of inspirational writing has this to say: "MOTIVATION IS LIKE A FIRE. UNLESS YOU CONTINUE TO ADD FUEL TO IT, IT WILL GO OUT"
I have found that often times, during later periods of listening, there are additional meanings to a story. Sometimes, it just becomes clearer, at other times, it sparks off ideas that you never thought of before. It helps to reinforce the inspirational story's impact through repetition. 1. Pay rapt attention 2. Get the lesson 3. Apply the lesson to your life, business, relationship, etc 4.Repeat the inspirational story to yourself often. I will love to hear your view on this topic. Do well to drop your thoughts and comments below. Labels: get inspired, how to benefit from inspirational stories, inspirational stories, Inspirational stories will not give you money, Inspirational stories will not make you rich, motivational stories.